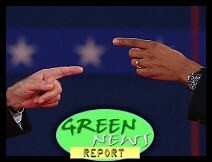 " 'Green News Report' - October 18, 2012	"
As the U.S. presidential campaign enters its final phase, Yale Environment 360 compares the sharply divergent views of President Barack Obama and Mitt Romney on the environment and energy. Romney is right about one thing: The government does pick winners and losers in the energy sector... the big winners of federal support are the already immensely profitable fossil fuel and nuclear industries, not sustainable energy. Political rhetoric about the blame over gas prices and the power to change them - whether Republican claims now or Democrats' charges four years ago - is not supported by cold, hard figures. And that's especially true about oil drilling in the U.S. More oil production in the United States does not mean consistently lower prices at the pump. +What would "drill baby drill" mean for gasoline prices? + Would the Keystone XL pipeline affect gasoline prices? +Is monetary policy to blame for the recent price spike? +How do U.S. fuel taxes compare to other nations? +Could we shift to a single national gasoline blend? +Why did oil and gasoline prices fall sharply in late 2008? +If we end tax breaks for oil companies, would gasoline prices change? +Do oil companies receive the same tax breaks as other companies? +How does current U.S. oil production compare to previous years? +How much oil is coming from federal lands relative to previous years? +How have U.S. petroleum imports changed in recent years? +Is the U.S. sitting on over a trillion barrels of oil? Adam Fetcher, a spokesman for the Obama campaign, "defended the president's silence on climate change during Tuesday's debate" in an email to The Hill Wednesday. The problem with the sort of energy debate we saw on Tuesday is not just that it's fatuous, though it certainly is that. The problem is that you can't solve a problem if you don't even acknowledge it exists. The true challenge facing the next President is not how to bring down gas prices, which may or may not come down as a result of global trends. It's how to move beyond the tired arguments of the past and act as if the future matters. Having an energy conversation without talking about climate is like talking about smoking and not talking about cancer. You can't talk about it unless you talk about what the stakes are for the climate. It's unlikely we'll see it in the third. Who is the more pro-coal candidate? Who is the more pro coal-candidate is who is going to most hastily speed our headlong flight of disaster towards a climate future in which we have not higher gas prices, higher temperatures. And the thing that's so frustrating is the future farmers of america who will see livelihoods destroyed are not voting in the election. The people who live in inland coasts who will see their habitats destroyed are not voting in the election. The people working in coal companies now are voting in the election. I understand what their livelihood means to them. there's an asymmetry between the people voting and the future people who aren't. We talk about it all the time in terms of deficit be we don't talk about it in terms of climate. We have many successes to celebrate for the Clean Water Act's 40th, but our industry-controlled Congress is making it awfully hard to feel good about blowing out the candles.... Unfortunately, some members of Congress are dead serious on threatening your right to clean air and water. The bill included attacks on the Clean Water Act, Clean Air Act, the Surface Mining Control Act and EPA, among other things, including rejecting the science on climate change. On Monday, a paper published in the journal Proceedings of the National Academy of the Sciences, or PNAS, concluded that large Katrina-sized hurricanes were twice as likely to form off the United States' southeast coast in hotter years than they were in colder years. Satellite images appear to confirm the claim by Californian Russ George that the iron has spawned an artificial plankton bloom as large as 10,000 square kilometres. The intention is for the plankton to absorb carbon dioxide and then sink to the ocean bed - a geoengineering technique known as ocean fertilisation that he hopes will net lucrative carbon credits. Scientists studying Earth system processes, including climate change, are now working with one of the largest supercomputers on the planet. The National Center for Atmospheric Research (NCAR) has begun using a 1.5 petaflop IBM system, called Yellowstone, that is among the top 20 supercomputers in the world, at least until the global rankings are updated next month. New MIT research suggests carbon dioxide has direct impact on glaciers and ice caps. The extreme variability of wind and solar power in Germany is laid bare by 2012 data that also illustrates a particular vulnerability when power demand surges on cold winter days - they are often both weak at the same time. The country’s grid operators this week said a surcharge on households’ electricity prices financing the expansion of renewable energies will increase by 47 percent on the year in January. A typical family of four will have to pay about €250 ($324) per year on top of their bill, but many large companies are exempt from the surcharge to safeguard their competitiveness. As the company pursues construction of a 1,179-mile-long cross-country pipeline meant to bring Canadian tar sands oil to South Texas refineries, it's finding opposition in the unlikeliest of places: oil-friendly Texas, a state that has more pipelines snaking through the ground than any other. Human activity is affecting Earth in many ways, but a new study suggests that continued population growth and its impact on climate and ecology could trigger a more profound chain reaction of effects within little more than a decade. Nordhaus's blunt piece - "Why the Global Warming Skeptics Are Wrong" - is worth reading because he is no climate hawk. "The skeptics' summary is based on poor analysis and on an incorrect reading of the results." It is unpleasant to talk like this. People don't want to hear it. "We know that pumping oil out of the ground does not create many jobs. It does not foster an entrepreneurial spirit, nor does it sharpen critical faculties." The world is likely to build so many fossil-fuelled power stations, energy-guzzling factories and inefficient buildings in the next five years that it will become impossible to hold global warming to safe levels, and the last chance of combating dangerous climate change will be "lost for ever", according to the most thorough analysis yet of world energy infrastructure. "The door is closing," Fatih Birol, chief economist at the International Energy Agency, said. "I am very worried - if we don't change direction now on how we use energy, we will end up beyond what scientists tell us is the minimum [for safety]. The door will be closed forever." Heads in the Sand: Warning: "Climate change is occurring … and poses significant risks to humans and the environment," reports the National Academy of Sciences. As climate-change science moves in one direction, Republicans in Congress are moving in another. Why? Tim Phillips, president of Americans for Prosperity, says there's no question that the influence of his group and others like it has been instrumental in the rise of Republican candidates who question or deny climate science. "If you look at where the situation was three years ago and where it is today, there's been a dramatic turnaround. Most of these candidates have figured out that the science has become political," he said. Groups like Americans for Prosperity have done it." « PREVIOUS STORY "Green Party Presidential, VP Candidates Arrested at Presidential Debate, Shackled for Eight Hours"
"'Green News Report' - October 18, 2012"
Have you analyzed the latest denier script concerning polar ice extent which fifth graders understand better than deniers? Intermittent renewable energy requires grid balancing services, primarily from stand-by baseload fossil fuel capacity or battery and pumped storage, but also via interconnectors bringing power from other countries and regions. For example, while the renewable energy lobby cheered a solar power peak at 22.4 gigawatts (GW) (or about a third of total lunchtime demand) on Friday, May 25, perhaps more relevant was a slump in combined wind and solar power during a surge in demand in an early February cold spell. However, that only applies when considering aggregate weekly or monthly data. In fact the two do not average out. While the grid survived, the risk of blackouts is clearly elevated without substantial fossil-fuelled back-up capacity. The trend towards more renewable energy generation in Europe makes more regulation inevitable, including capacity mechanisms or strategic reserves to ensure gas power headroom for cold days in February, for example, and other publicly funded resources including battery storage and interconnectors. "China's state-run banks have extended billions of dollars of credit to solar companies. In the latest sign of state patronage, the China Development Bank Corp CHDB.UL earlier this month said it would prioritize loans to 12 top solar companies." Cool...lets borrow money from China and give it to crony solar companies to compete with Chinese solar companies...right...that's the ticket! The National Academy of Sciences concluded in 2001 that a handful of clean energy technologies returned about $30 billion on an R&D investment of about $400 million. The United States is an amazing venture capitalist when it comes to clean energy R&D. (Think Progress, emphasis added). It still holds true (ibid). German solar power plants produced a world record 22 gigawatts of electricity per hour - equal to 20 nuclear power stations at full capacity - through the midday hours on Friday and Saturday. Yes, Davey, solar power "generation" is greatly reduced during cloud cover. Ever hear of energy storage? Yes, of course I have heard of energy storage...in fact I included "batteries" (just one of many forms of energy storage) in the last line of my post. I suspect that in 100 years we will have a reliable renewable energy source. In the mean time, we will continue to rely on carbon. Germany is pretty bold...we will see how that plays out. Torresol Energy has overcome one of solar energy’s biggest challenges: operating when the sun doesn’t shine. The 19.9 MW Gemasolar concentrated solar power plant in Spain’s Andalucia province has two tanks of molten salt (MSES) that store heat energy generated throughout the day. Unlike normal plants that have less thermal storage or none at all, this stored energy enables Torresol to satisfy peak summer energy demand long after sunset. A joint venture between Spanish giant Sener and Masdar, Abu Dhabi’s Future Energy Company, the Gemasolar plant has hurdled one of alternative energy’s biggest obstacles. Wrong again, Davey @#3! The Inspector General who investigated the Solyndra bankruptcy found ZERO evidence of 'crony capitalism', that the program was steered toward political benefactors, donors, or friends or family. In fact, major Republican donors also invested in Solyndra, so how do you explain that? So now that you know the facts, you'll stop spreading that lie, right? Why do you want the U.S. to lose the global clean energy race, Davey? China and Germany, whose steady and consistent investment in their domestic solar energy industry is now paying off, are winning, and the U.S. is losing today, thanks to the help of Republicans working on behalf of the fossil fuel industry. As you saw in the story, Germany is working through the kinks in their transition now. The U.S. isn't even on the gameboard. I can understand why Republicans do it --- the fossil fuel industry funds the GOP 8-to-1 over Democrats, even though the industry fares better under Democrats, according to the hippie lefty pinko treehuggers over at the National Journal. But I can only surmise why you would WANT to spend more of your money on the ever-increasing costs of finite commodities like fossil fuels --- unlike wind and solar, which have ZERO fuel supply costs or external pollution costs once the facility opens. I can only guess that you WANT to your money to go to the fossil fuel industry to pollute your air, land, and water for free and make you pay to clean up it up later (Superfund) AND make you pay for it in higher health care costs, mercury-laden fish, more billion-dollar weather disasters, and long-term climate destabilization for coming generations.